View photo galleries of past events. Read or Submit a "Success Story"! View a list of upcoming Region Meetings. The 2019 Legislative Session Ends! The New Mexico Legislature completed their work at noon on Saturday and sent a $7 billion budget plan to Governor Lujan Grisham that would increase spending on public schools by $449 million or 16 percent over the FY19 operating budget. Total general fund appropriations for public education of $3.25 billion are 47.5 percent of total FY20 general fund appropriations. The budget bill makes large strides to address the court decision in Yazzie/Martinez with 6 percent compensation increases to school employees, a more than doubling of the at-risk formula factor to 0.25, large investments in extended learning time for at-risk children, and increases for prekindergarten. Special and Supplemental Appropriations includes $26.5 million for public school instructional materials. The Legislature passed 44 bills and 14 memorials directly related to public education including to two similar reform bills, House Bill 5 and Senate Bill 1, which make changes to the public school funding formula to provide for increased educational time, increased educator pay, and improved budgetary accountability for programs that serve at-risk students. Legislation that passed by both House and Senate now goes on to the Governor for action by April 5th. A listing of all public education bills now heading up to the Governor for action along with memorials approved by the House and Senate can be found on our website or by clicking here. Thanks to our NMSBA Executive Board, Board of Directors and all school board members for your advocacy work on behalf of public education during the legislative session. I would also like to acknowledge our partnership with the Stan Rounds and the New Mexico Superintendents Association during the session. And finally, a special and sincere thanks to Lilliemae Ortiz, our Legislative Liaison, for her assistance again this legislative session. We are indeed fortunate to have her working on our behalf. We will issue our final report following the Governor’s April 5th deadline. In the meantime please feel free to call us if you have any questions. NMSBA Conducts 2018 Annual Convention! School board members from across New Mexico gathered in Albuquerque December 7-8, 2018 to participate in the 2018 Annual Convention of the New Mexico School Boards Association (NMSBA) at the Embassy Suites Hotel in Albuquerque. School board members listened to keynote speakers and participated in informative breakout sessions. Association members also elected new officers for the coming year and recognized school board members for their outstanding service and training accomplishments. See Post Convention News Release (below) for more information. Gubernatorial Candidates Address Successful Leadership Retreat! 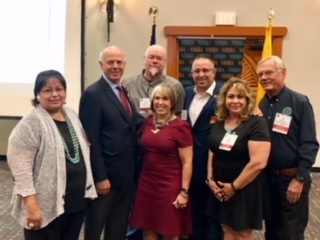 We are very pleased both Gubernatorial Candidates, Congresswomen Michelle Lujan Grisham and Congressman Steve Pearce addressed the 2018 NMSBA Leadership Retreat at the Sagebrush Inn in Taos July 13-14. The candidates provided a brief update on federal education issues, shared their plans for public education in New Mexico and answered numerous questions from members in attendance. In preparation for the candidates NMSBA prepared and presented a White Paper – Education in Our State, Summer of 2018 which states the priorities, challenges and guiding principals we face as school boards in New Mexico today. 2018 NMSBA School Law Conference A Success! Thanks to all who attended NMSBA’s 39th Annual School Law Conference. We received many compliments on the quality of the program and the many learning opportunities provided. We also had a great 60th Anniversary Celebration with many dignitaries and partner organizations presenting congratulations and best wishes. Twelve of our past presidents were in attendance as well. To view or download all conference presentations please click here School Law Conference Presentations or go to the Cuddy & McCarthy Resource webpage. The New Mexico School Boards Association is proud to be celebrating 60 years of service to New Mexico’s school boards. Created in 1958 by a visionary group of school board members and educators, NMSBA has now served as a leader in New Mexico’s public education system for six decades. A special 60th Anniversary Reception was held on Friday, June 8 at the Hotel Albuquerque, in conjunction with NMSBA’s 39th Annual School Law Conference. The reception included: Mariachi Entertainment; Review of the Association’s History; Recognition of Past Presidents and Executive Directors; Presentations by Special Dignitaries; and Viewing of Photo and Memorabilia Exhibits. Twenty-Four NMSBA Scholarship Award Recipients Announced! NMSBA Excellence in Student Achievement Awards Announced! The New Mexico School Boards Association announced recipients of the 2018 Excellence in Student Achievement Awards. The awards, sponsored by NMSBA, are presented to individuals selected by local boards of education throughout New Mexico who have played an important role in improving student achievement in their local school district. For specific information about award recipients, please contact the local school district. Sixty-four (64) school boards participated in this year’s program and one hundred six (106) award recipients were selected. Recipients will be honored at upcoming school board meetings throughout New Mexico. Please click here access News Release which includes the names of all award recipients. NMSBA is now posting superintendent vacancies for member boards on our Superintendent Search Page. Please contact Joe Guillen, Executive Director, for additional information. See the latest posts by clicking here. archived for up to a year for board member reference.